I recently set off on a Sandwich Quest to try some new sandwiches including the falafel at Mama’s Vegetarian (review coming) and the lamb gyro at Opa. On my walk to Opa, I passed Marabella Meatball Co. (MMCo.) and as luck would have it they were celebrating their one-year anniversary with a $5 sandwich special. That’s as good a reason as any to change plans and give a meatball sammie a shot. The majority of MMCo. 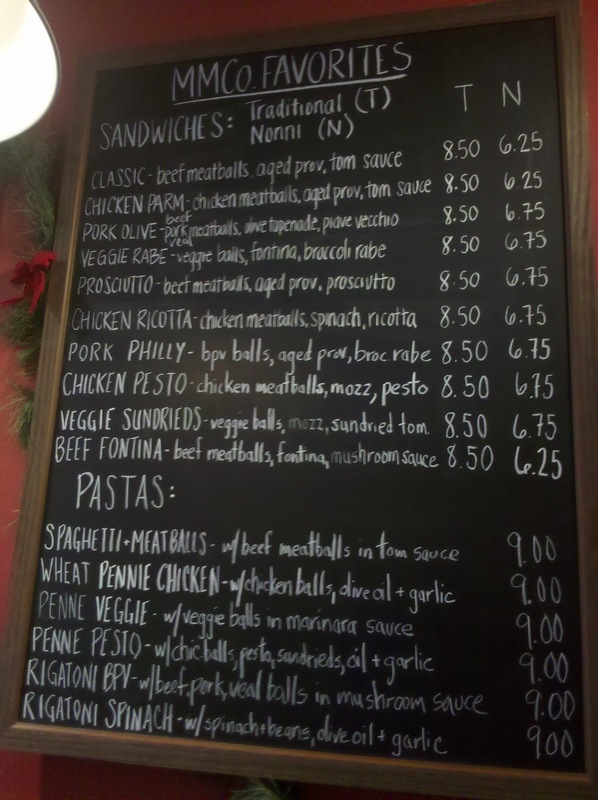 's menu is focused on meatballs, but you could order pasta, if desired. Unless you are a regular, I don’t see any reason why you would get the pasta. I’ll stick to their specialty. You can create your own meatball sandwich or choose from a list of MMCo. favorites. If you go with the mix-and-match you choose from four types of meatballs (beef, pork, chicken or vegetarian), three sauces (tomato, marinara or mushroom) and four cheeses (provolone, fontina, piave vecchio or mozzarella). I skipped the create your own option and ordered the Classic sandwich off the favorites menu with beef meatballs, aged provolone and tomato sauce. 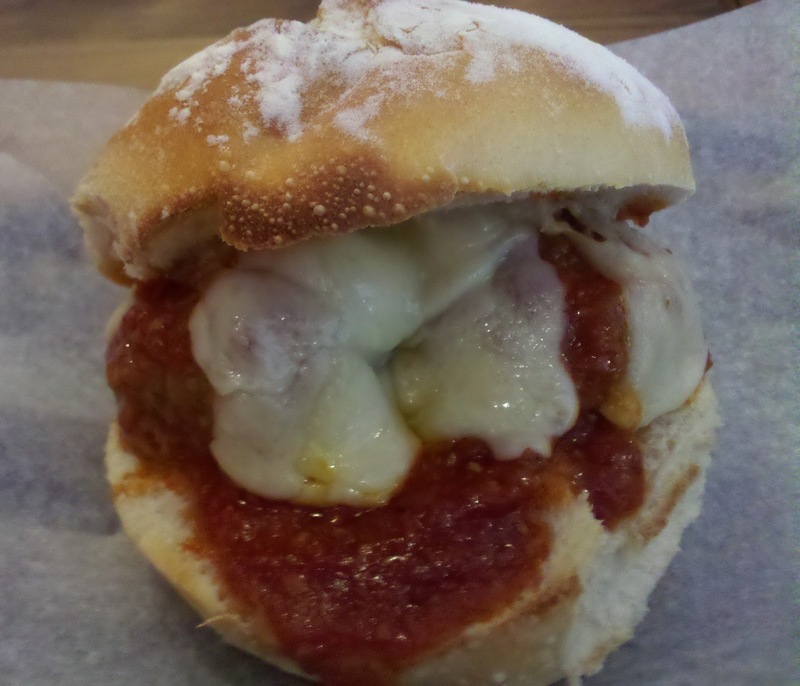 The $5 anniversary special was for the smaller "Nonni" option, which comes with two meatballs on a round roll. The normal price is $6.25. The "Traditional" option is served on a long roll with four meatballs and costs $8.50. The Classic was good, not amazing. The cheese was not fully melted and the meatball didn't pack a ton of flavor. The sauce was sweet and plentiful, though, and the bread was excellent. It didn’t fall apart even with all the sauce. I’d recommend MMCo. if you are looking for a quick, decent bite. The Nonni is probably the best option for most people since the four meatball sandwich seems like a lot of meatball for one person. I’m willing to go back to try another favorite. Stogie Joe’s still holds lead within the meatball portion of Sandwich Quest. Any other meatball recommendations to add the list? Falafel sandwich Philadelphia is a most preferable sandwich among customers and Makkah Market is famous for providing Halal products, Islamic Clothing, Islamic Books and many more Islamic items in Philadelphia.